Choosing a builder is not an easy task. We looked at 100 model homes, spoke to dozens of salespeople, wrote letters to homeowners and knocked on doors of previous customers. Eventually the list was narrowed down to two builders. The final decision was made when we visited the Rosella and saw Mike working with customers that had signed contracts weeks before. He wanted to be certain his customers were satisfied with their new home. It was obvious that John Cannon Homes were building homes and not just another house. Having the salesperson involved after the sale is a nice touch and a great opportunity to upsell. You may want to consider implementing that service throughout the company. Our biggest obstacle to selecting a builder was working through the maze of salespeople, some of which kept us from considering a builder. "The mistakes in the model won't be in your home because the builder now knows what he's doing" was our favorite comment. "Sign now before the price increase" was almost universal. "We can build anything, anywhere for $90/sf, this model for $71 or that model for $83" all while trying to sell a home priced at $125/sf proved the ignorance of building and lack of integrity of the salesperson. One salesperson had his sales manager call him four times pretending to be his wife. The story was the salesperson had to leave the office to watch his kids because his wife was going out of town. They combined it with the "sign now or face a price increase" story. That made us question the integrity of the company and the sanity of the salespeople. We wondered if their boss knew how many customers they were chasing away. We starting seeing salespeople as the "gatekeepers", the person that blocks the sale. We walked away from some builders because we didn't want to deal with the nonsense that day. We have been in our new home for two years now and we still love it. It’s a gorgeous home and has proven itself to be quality-built. 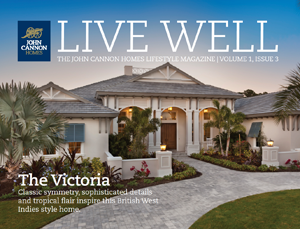 We did extensive research before selecting John Cannon Homes and now know we made the right decision. Our home has none of the stress cracks, stuck windows, loose cabinet doors, leaks etc that we found in homes by other builders. The few minor warranty issues we had were addressed immediately after contacting your office. Please thank Jamie O'Driscoll for us. “I just wanted to come back and say that we went to the other models after visiting yours and there is no comparison between the quality and level of finish. One other builder had a 4’ long piece of baseboard with a splice in the middle of it. Your model, while not finished yet, will be the best one here.” - Wayne, a visitor to our Avianna model home had this to share after touring completed model homes in The Concesssion and The Avianna which is open during construction for hard hat tours. Well, it actually happened….Lots of ups and downs during the ~2 year process; but we are closed and the design and construction is quite spectacular. Nelson and Jill have been amazing, but you already know that. We appreciated the ease of the close at the end and the straightforwardness on the warranty documents. We are quite busy over the next few weeks with the move and travel for work, but would welcome a chance to debrief on the entire process and show you the furnished house. The front of the house looks better then I ever expected. Seven foot elevation makes the entry very impressive. I get about 6 -10 comments every day from friends and strangers! Great work! Very Impressed with the start of our new home! We want to thank you for the beautiful home you built for us and to let you know how much we appreciate your help with this project. You were always around to personally supervise every detail, you kept us well-informed of the progress, and you were always available for a phone call or a meeting on the homesite. We feel the construction of the house is of excellent quality. If we ever build another house, you will be the builder! We would like to thank both of you and your staff for your attentiveness to our needs over the past six months, and the manner in which it was handled. The quality of construction is truly reflective of a quality, custom-built home. It is nice to feel that you truly received what you paid for and more. Thank you once again for making our first home-building experience a positive one! Before choosing John Cannon as the builder, I talked to several leading builders in the area and even though I had plans drawn by an Architect, I abandoned them and the other builders ideas and bids in favor of John Cannon's in-house design and competitive estimate. John Cannon is a dedicated professional. He has great taste. He understands the importance of curb appeal and is clearly in touch with tomorrow's trends and technology. I will certainly consult him about building again in the future. When we made the decision to move south from Boston, we originally were considering the Tampa area, but our Realtor encouraged us to visit Lakewood Ranch. When we did, we both knew it was the type of community we wanted for our two children to grow up in. Of course the next step was to find a builder we felt comfortable with and who could build a home that would fit our family's lifestyle. "We absolutely love our new home and the whole concept of living in a master planned community. It's such a convenient location for schools and shopping. My husband has to travel to Tampa quite frequently so Lakewood Ranch was perfect for us. We also felt it was a good investment in the event we have to relocate for business reasons. We know the value of living in a community like Lakewood Ranch will only increase with time. We are confident we could not have picked a better community or a more qualified, more attentive builder than John Cannon Homes. John, you truly have vision and can do some amazing things. We can't wait to see how it all comes together on the elevations.